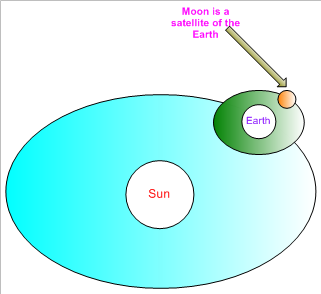 Satellites are small celestial bodies which revolve around planets.Watch the image where moon is shown as a planet of the Earth. As the planets revolve around the sun, the satellites move with them. As a result , satellites also revolve around the sun .Like planets ,satellites shine by reflecting light from the sun. All planets except Mercury and venus have satellites . Jupiter’s has the most number of satellites (62).The satellites are smaller than the planets around which they revolve .